Discovered in an abandoned distillery in Cognac, this unique spirit is one of only 478 bottles remaining in the cask. Hand-bottled and sealed with wax then placed in a velvet-lined leather box which includes a Certificate of Bottling stating the date it was bottled and the bottle number. A 50 ml miniature is included in the package, so consumers who purchase the bottle as a gift can still sample the cognac, or the bottle can be added to a collection, while the collector can still take pleasure in a tasting. Price includes FREE SHIPPING in Hong Kong, and includes a FREE HK Golfer gift. "Old – and fresh. These words, so apparently incompatible, might summarise just what we seek in our offerings – and after much journeying, find. They perfectly describe this magical Cognac. Distilled in 1950 in one of the last of the old-fashioned alembics, and having rested for all its sixty years in French oak casks at the distillery, it has aged but not faded, remaining still amazingly youthful even in its extreme old age. The nose is refined, balanced, full of woodland scents and dried fruit. The palate is smooth and harmonious, but retains the ‘fire’ of the finest cognacs. You find vanilla, but not too much. Astonishingly, the oak has not dominated the flavour of the fine eau-de-vie. We were forced to bottle this before its strength fell below the legal limit; it measures 41.8 per cent. Now, trapped in the glass, it will remain perfect forever, so that your children – or even their children – can share this sublime experience." 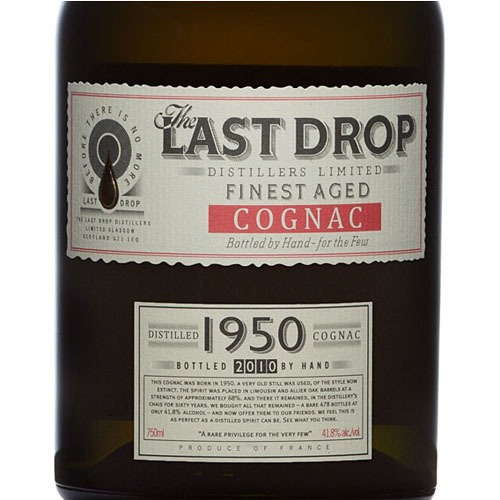 – James Espey, The Last Drop Distillers Ltd.